Above photo, circa 1938, kindly sent by Rory Kehoe. Evenhill House sign left July 1991, sign right June 1993. 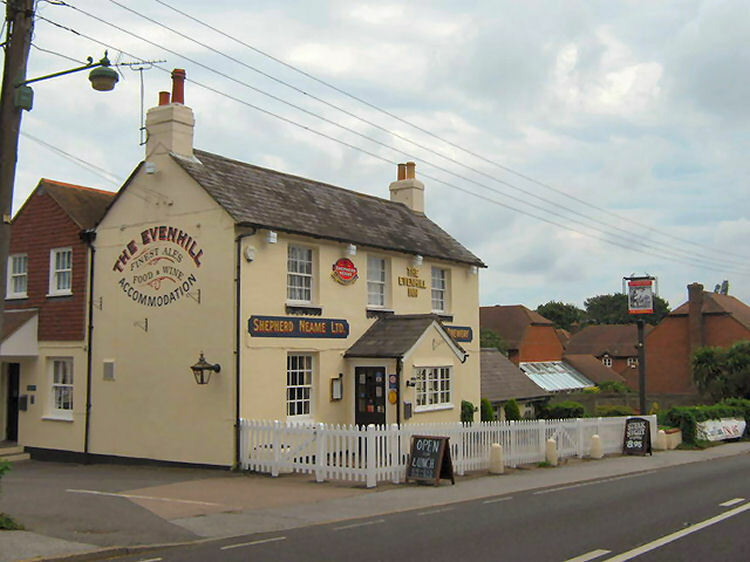 "Originally built as cottages in the 16th century, the Evenhill lies on the A257 in Littlebourne - between Canterbury and Sandwich. 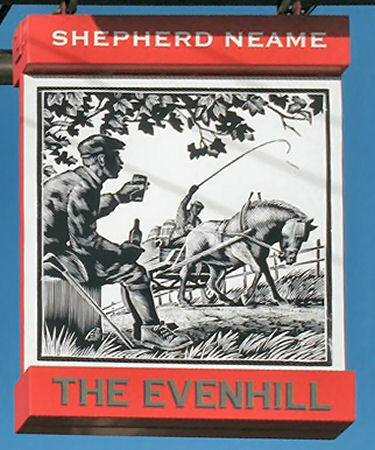 The comfortable, traditional Victorian bar with its oak beams and fireplaces, leads onto the Evenhill's popular extensive split-level restaurant. The superb restaurant serves delicious home cooked meals - perfect for lunches and dinners or special occasions. Tasty bar meals are also available throughout the day. A pleasant garden completes the picture of a typical yet pleasantly surprising Kentish pub. Howletts Zoo Park is close by, as is the historic city of Canterbury. The coastal towns of Sandwich, Margate, Ramsgate and Broadstairs are a short drive away and there are many golf courses nearby." Further information, hopefully to follow. Whitstable Times and Herne Bay Herald, Saturday 11 May 1878. 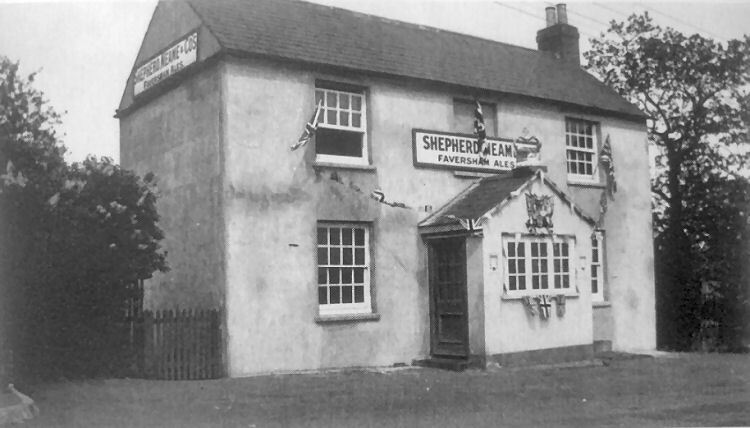 James Newing, for whom Mr. Delasaux appeared, was summoned for keeping his public house, the "Evenhill," Littlebourne, open during prohibited hours, on Sunday morning. A police constable in plain clothes entered the house and found several persons there with cups containing beer before then. The landlord stated that the people were there in respect of a transaction entered into on the previous night, they were in fact engaged in housework. A great deal of evidence pro and con, was given, and eventually the case was dismissed. The Dover Express, Friday, September 05, 1919 ; pg. 8; Issue 3190. EAST KENT NEWS. TEMPLE EWELL. DART CLUB. Members of the Dart Club of the "Fox," Temple Ewell, visited the "Evenhill House," Littlebourne, on Saturday last, when excellent games were played, the homesters coming out eventually victors by three games to two. An excellent tea was provided by Mr. H. W. Maxted, landlord of "Evenhill," when upwards of 50 sat down after the match. A very pleasant musical evening was spent, songs being contributed by the visitors and homesters.